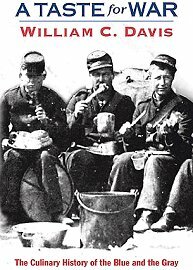 Feeding the troops was the responsibility of the Commissary Department, and both the Union and Confederacy had one. The job of this organization was to purchase food for the armies, store it until it could be used, and then supply the soldiers. It was difficult to supply so many men in so many places and the North had a greater advantage in their commissary system was already established at the outbreak of the war, while the Confederacy struggled for many years to obtain food and then get it to their armies. Choices of what to give the troops was limited as they did not have the conveniences to preserve food like we have today. Meats were salted or smoked while other items such as fruits and vegetables were dried or canned. They did not understand proper nutrition so often there was a lack of certain foods necessary for good health. Each side did what they could to provide the basics for the soldiers to survive. Because it was so difficult to store for any length of time, the food soldiers received during the Civil War was not very fancy and they did not get a great variety of items. 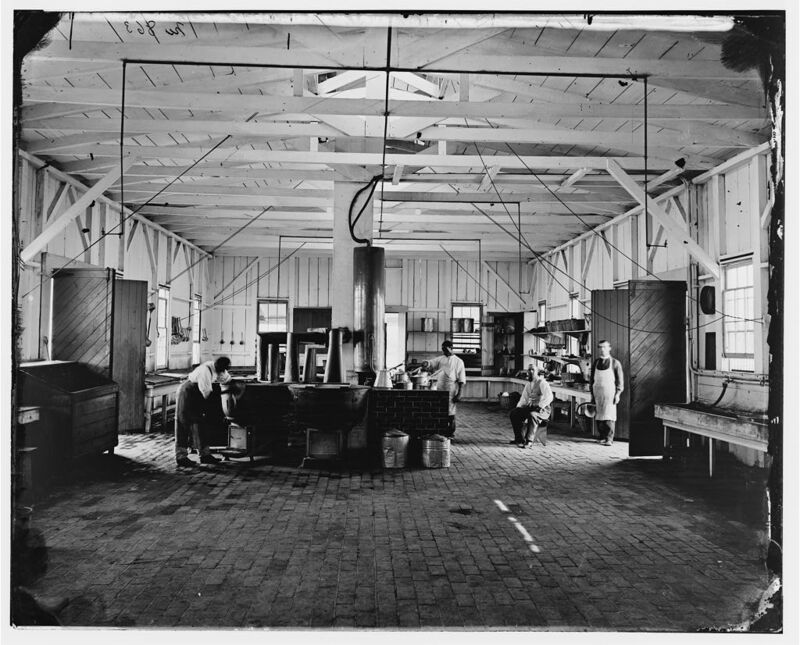 This photograph shows what a temporary Union commissary depot looked like during the war. Large wooden barrels containing salted meat, coffee beans, and sugar are stacked next to crates of hardtack. It took a lot of food to feed the army even for one day! The daily allowance of food issued to soldiers was called rations . Everything was given out uncooked so the soldiers were left up to their own ingenuity to prepare their meals. Small groups would often gather together to cook and share their rations and they called the group a "mess" , referring to each other as "messmates" . Others prided themselves in their individual taste and prepared their meals alone. If a march was imminent, the men would cook everything at once and store it in their haversack , a canvas bag made with a sling to hang over the shoulder. Haversacks had a inner cloth bag that could be removed and washed, though it did not prevent the bag from becoming a greasy, foul-smelling container after several weeks of use. The soldier's diet was very simple- meat, coffee, sugar, and a dried biscuit called hardtack . Of all the items soldiers received, it was this hard bread that they remembered and joked about the most. Hardtack was a biscuit made of flour with other simple ingredients, and issued to Union soldiers throughout the war. Hardtack crackers made up a large portion of a soldier's daily ration. It was square or sometimes rectangular in shape with small holes baked into it, similar to a large soda cracker. 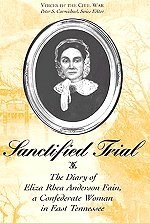 Large factories in the north baked hundreds of hardtack crackers every day, packed them in wooden crates and shipped them out by wagon or rail. If the hardtack was received soon after leaving the factory, they were quite tasty and satisfying. Usually, the hardtack did not get to the soldiers until months after it had been made. 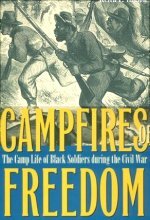 By that time, they were very hard, so hard that soldiers called them "tooth dullers" and "sheet iron crackers" . Sometimes they were infested with small bugs the soldiers called weevils, so they referred to the hardtack as "worm castles" because of the many holes bored through the crackers by these pests. The wooden crates were stacked outside of tents and warehouses until it was time to issue them. Soldiers were usually allowed six to eight crackers for a three-day ration. There were a number of ways to eat them- plain or prepared with other ration items. Soldiers would crumble them into coffee or soften them in water and fry the hardtack with some bacon grease. 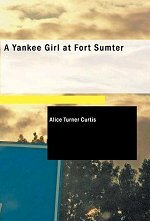 One favorite soldier dish was salted pork fried with hardtack crumbled into the mixture. Soldiers called this "skillygallee" , and it was a common and easily prepared meal. 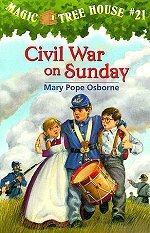 Describes some of the foods eaten in the North and South before and after the Civil War and the impact of the war on what foods were available and how they were prepared. Includes recipes. 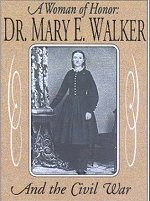 A picture of Mary Walker that allows us to see the furrows in her brow as she continued to stubbornly stick to her values. 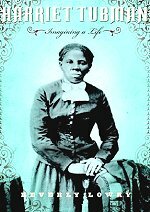 This book is eye-opening and brings to the forefront many women's rights issues that we may not even be aware of. 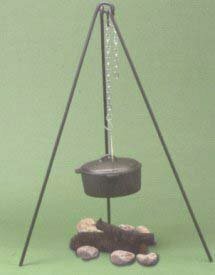 The legs are for ease of use in campfires. Flanged lid to place coals on top of oven. Great for stews, chilli, roasts complete recipes for everything including old-fashioned bread. A must for reenactors villages. Some of the other items that soldiers received were salt pork, fresh or salted beef, coffee, sugar, salt, vinegar, dried fruit and dried vegetables. If the meat was poorly preserved, the soldiers would refer to it as "salt horse". Sometimes they would receive fresh vegetables such as carrots, onions, turnips and potatoes. 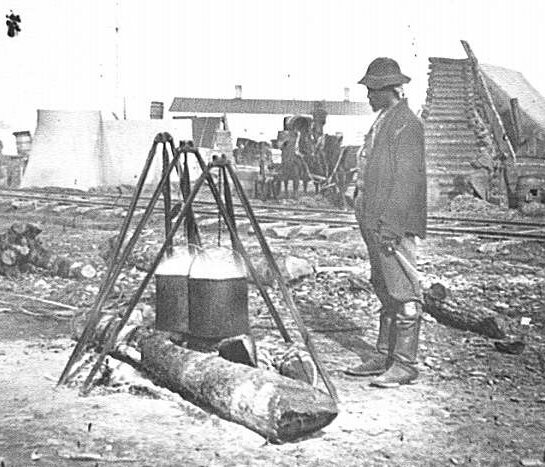 Confederate soldiers did not have as much variety in their rations as Union soldiers did. 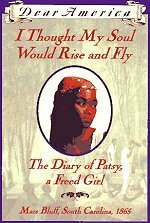 They usually received bacon and corn meal, tea, sugar or molasses, and fresh vegetables when they were available. 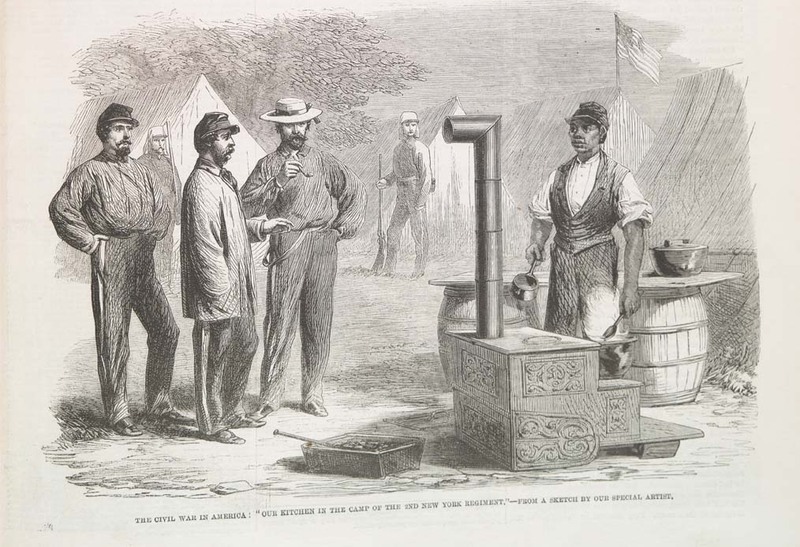 While Union soldiers had their "skillygallee", Confederates had their own version of a quick dish on the march. Bacon was cooked in a frying pan with some water and corn meal added to make a thick, brown gravy similar in consistency to oatmeal. The soldiers called it "coosh" and though it does not sound too appetizing, it was a filling meal and easy to fix. Large Skillet 2.25 inches in depth. Not for standard home stove. Perfect for use on the Grill or over campfires when you are cooking for the "troops". Opposite handle for easy use of this heavy skillet. 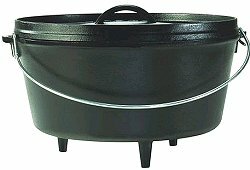 Constructed of forged iron, this will hold Cast Iron Dutch Ovens. It's easy to set up and has an adjustable 26" chain so you've got control of the heat. 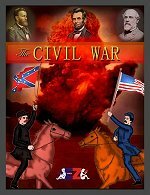 Civil War Recipes reproduces, in their original wording, receipts that appeared in the pages of Gody's Lady's Book during the decade of the Civil War. Editors Lily May Spaulding and John Spaulding have added annotations to assist those cooks who might not know, for example, that “buscuits" often referred to what we now call “cookies." 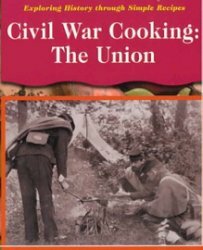 They also provide a brief overview of the technical state of cooking in America before and during the Civil War. Although leavening agents were not unknown, the recipe for “Christening Cake" requires whisking the whites of sixteen eggs into a full froth and beating the entire mixture for more than thirty minutes. 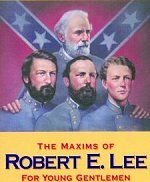 We know the uniforms they wore, the weapons they carried, and the battles they fought, but what did they eat and, of even greater curiosity, was it any good? 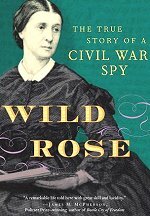 Now, for the very first time, the food that fueled the armies of the North and the South and the soldiers' opinions of it--ranging from the sublime to just slime--is front and center in a biting, fascinating look at the Civil War as written by one of its most respected historians. 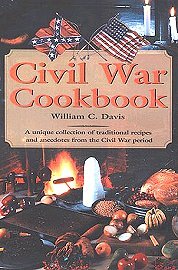 There's even a comprehensive "cookbook" of actual recipes included for those intrepid enough to try a taste of the Civil War. 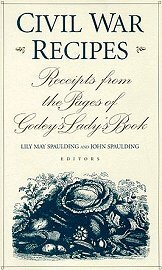 Every Civil War buff will want to own this unique cookbook, which takes the reader right into the kitchens of 19th-century America. 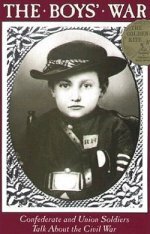 Illustrated with wonderful period photographs, it intertwines history and food for a fascinating new look at the lives of Civil War soldiers and their families. Traditional recipes, illustrated with full-color photographs and highlighted with historical anecdotes, include instructions for recreating treats sent in care packages to soldiers in the field, camp dishes, and special meals.